The multi-gillion dollar apparel industry knows well who their top audience is- the teenager. 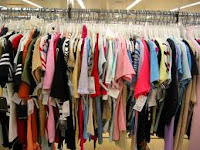 Just look at most of the magazines, commercials and mall stores and you’ll notice that the goal of apparel marketing is convincing teenagers that they can't be at their best or look their prettiest without particular clothing. Browse through some of the teenage clothing websites, and you’ll find a definite provocative slant in nearly every one. The advertisers are consistent in their preoccupation with the sexual content of clothing. What is easiest to forget in this world of teenage fashion is we’re talking about clothes. Just clothes. Pieces of cotton sewn together to cover these bodies we possess for 7o years or so. Life is all about having and maintaining the right perspectives on God and ourselves. When we lose that mature perspective, we buy into the marketing world’s “sell” to make a buck and we convince ourselves that what we wear determines who we are. So, our role as parents becomes huge! What our kids view as the “norm” has to be countered with an alternative to the norm. It’s imperative that we teach our teens that who they are has nothing to do with what they wear. It’s important that we teach them to focus on their hearts and not their cosmetics. Many years ago, we loaded up the kids and drove to Seymour, Missouri east of Springfield. I was doing a project for a cross-cultural doctoral class I was taking at the time. I needed to spend a day interviewing an Amish family. It was a fun day for the family and the people were very nice. I remember one of my observations was that “dress is relative.” I observed that the Amish struggle as much as any with comparison and peer pressure. Yes, they dress “plain,” but there are different definitions of plain. Compare teen dress in the 50’s with teen dress now and it’s certainly more provocative now. But the heart struggles existed then too. In other words, it’s not the clothes worn but the heart corrupted. The answer isn't to lay out overalls for our kids each day or to force them to wear uniforms. The answer is to be about heart surgery as we raise our kids. Yes, don't allow inappropriate clothing, but go deeper with your teen. Discuss the “whys” behind what they wear. Don't buy the “I have no idea- it’s just an outfit” explanation. Teach them how to value their hearts more than how they look. And of course, for some teens, it’s not about over dressing it’s about under dressing. That was more my problem. I didn't care enough about what I wore. The key is balance. So, when the clothing concerns you, take the time to discuss it with your teen. Don't just lecture them but talk with them. Give them an objective perspective on what really matters and help them be more concerned with purity of heart instead of the latest fad. Teach your kids that purity and respect is possible without having to live with the Amish.